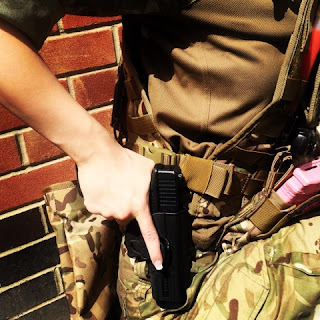 Nuprol Glock Series Retention Paddle Holster and Drop Leg Platform Review. A couple of Sundays ago, I popped into my local Airsoft shop – JD Airsoft, to pick up a few last minute bits and bobs ready for my weekend of Airsofting in the South for Ironsight’s Second Birthday Game, and whilst I was there I picked up a Nuprol EU Glock Series Retention Paddle Holster and Drop Leg Platform for my WE Glock 18c to replace my existing Holster. I had previously worn a Viper adjustable fabric holster but as many of you will have seen in my bloopers video – my holster game with that particular one was not too strong! Haha. The Nurpol Holster and Drop Leg Platform set up I run are purchased separately – the Retention Paddle holster at £19.99 and the Drop Leg Platform at £34.99 – which is easily the most I have ever spent on a Holster, but after using it I have decided it was definitely a worthwhile purchase! So let’s start with the Retention Paddle Holster, it’s made from durable black polymer for a right handed player, which is designed to be attached to the players belt via the paddle system. It can accommodate belts up to 5.6cm wide and 0.5cm thick, although I have ran mine on just my trousers and it was comfortable and secure. The angle of holster can be changed to whatever the player requires and It features a retention system and a push button release system so the pistol is secure but can still be drawn quickly. What I really like about the push button release system is that it covers the trigger which means the chance of accidental and negligent discharge is reduced drastically – there is nothing pleasant about shooting yourself in the foot by accident due to a holster malfunction! It comes with an Allen key to enable the user to adjust the angle or remove the paddle so it can be used with the Nuprol Drop Leg Platform. The Drop Leg Platform is made out of the same black polymer as the holster and is completely adjustable to the wearer. Now being quite petite, I was a little worried that the drop leg could have been too big. However, once I had removed the top buckle section and adjusted the straps, it was ready to go. The holster is easily attached to the drop leg using an Allen key, and again, can be placed at any angle. I have ran my holster with and without the Nuprol Drop Leg Platform, and I am definitely a fan of both. The drop leg platform fits securely and has zero movement, it was comfortable enough to wear for a full day of airsoft. It’s also easy to reach and the push button release means there’s no chance of it falling out whilst running about, which I have found with other drop leg holsters. 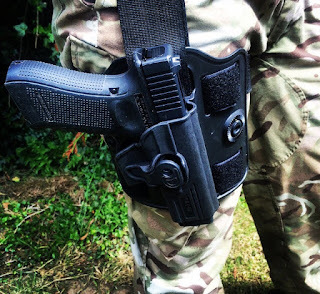 Although I think it looks better attached to the drop leg, running just the holster is also pretty comfortable - like I said, I ran mine on just my trousers and it was comfortable against the contours of my hip and had very no movement. It was also easy to draw at hip height. Overall, I'm really happy with the product, it is aesthetically pleasing, the quality is excellent and is really good value for the price! It offers a secure retention of the pistol and quick, easy deployment for those moments when you need to react. The holster is also available for other types of pistols such as 1911 and they are even cross compatible with other brands such as TM, which is fab. Id love to see more girls/women take up airsoft. id also like to see more advertising within the general public for airsoft. Most people i meet have no idea there is something called airsoft.